Hello and welcome to another Digital Tuesday Challenge. This week's challenge is called 'Flower Power'; simply make a card or projects with lots of flowers on it and be sure to use at least one digital element. Our sponsor this week is Karen's Doodles and they are giving away 3 digis to one lucky randomly chosen winner. To make my card, I used the Karen's Doodles image Butterfly Baby Girl. Isn't she adorable? I'm wasn't familiar with Karen's images before this challenge, but after viewing her beautiful artwork, I think I've become a big fan! I just love her style! My sketch is by 'I Heart Sketches', the paper is My Mind's Eye 'Stella Rose'; which I think is becoming my favorite new paper pad of all time. The prints and colors are just gorgeous! The main image is up on dimensionals, and I put Stickles on the butterflies and flowers. The flower embellie next to the sentiment is by Martha Stewart. 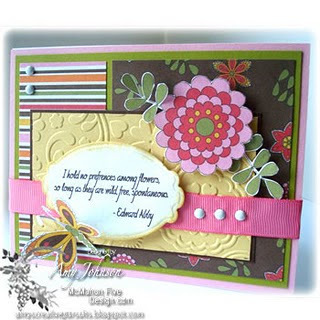 The quote is from Paper Fashions 'Planting Playful Words' sentiment set. Hello! Today I have a Penny Black card to show you for the Penny Black Allsorts Challenge Blog. The challenge was to 'Use Your Favorite Penny Black image and make anything you want'. That sounds simple enough, eh? Well, in all honestly, I don't have a favorite Penny Black image, because I love them all. So I just chose to use this cute teddy bear image from 'Teddy & Co'. The sketch is from The Sweet Shop, and the paper is 'My Mind's Eye' by Stella Rose. I stamped the flowers twice, cut the second bouquet out, and popped them up on dimensionals. Then I added a few Stickles to the flower centers. The first one uses an image from Papertrey Ink. The sketch is from Clean and Simple. Paper is Cosmo Cricket. I put Liquid Applique on the hat and would you believe I had to make the button from felt because I did not have one single large white button in my stash! I could not believe it! I must have a thousand buttons, I love buttons so I 'collect' them and have drawers and containers filled with them! White must be too boring for me, that's why I probably didn't have one. LOL! The three little dots below the sentiment are these cute sparkly, adhesive snow domes I found at a local scrap booking store. They are perfect for Christmas Cards. My second card using an image from Dustin Pike. The sketch is SSD71. The paper is Jolly by Golly also by Cosmo Cricket. I put Liquid Applique on Santa's hat too. He is also up on dimensionals. My third card uses an image and paper from Doodle Pantry. It's a pre-colored image. I didn't dare try to color an image of Baby Jesus on my own! He needed that 'glow' to look holy. It's hard for me to create a 'glow' with my markers. The layout is from Taylored Expressions 'Blast from the Past' blog hop, the snowflake is an adhesive sparkly foam piece from JoAnn's. I used more of those adhesive snow dome things by the sentiment, and the brads have a really neat soft fuzzy texture. My last card uses an image called 'Warm Winter Wishes' by Crissy's Digis. The sketch is by The Sweet Shop. I put Liquid Applique (are you beginning to think I really like this stuff? I do!) on all the Penguins clothes and Flower Soft on the ground. The snowflake is from JoAnn's. Hello! Today I have a new McMahon Vintage Digital to show you called 'Picking the Lilac'. I 'oohed' out loud when I first saw this image. I think it is so beautiful. My sketch is an old Midnight Madness one (MMSC99), and the paper is Prima 'Annalee'. The lace butterfly is from Martha Stewart. The main image is colored with Copics and mounted up on dimensionals. I made the 'fan' using a rosette die from MFT. Be sure to check out the McMahon Five Designs Blog to see the rest of this week's new releases, and while your at it, check out my fellow Design Team Members Blogs as well; they are listed in my sidebar. Hello and welcome to another Digital Tuesday Challenge. This week's challenge is 'Ice Cream Combos'; simply make a card or project that uses the colors of your favorite ice cream combinations along with at least one digital element. Our sponsor this week is MyGrafico and they are giving away 1 digi set and 20% off an in-store purchase to one lucky randomly chosen winner. Well my favorite ice cream in the world is Chocolate Almond Fudge, and I really don't like it combined with anything else, but since that was the challenge, I added pink and red to my card because I love vanilla ice cream with either Strawberries or Raspberries on it. To make my card I used a Heather Ellis digital image and I created my own sentiment. The sketch is an old MFT one (MFTWSC13), the paper is Bo Bunny 'Crazy Love'. Hello! 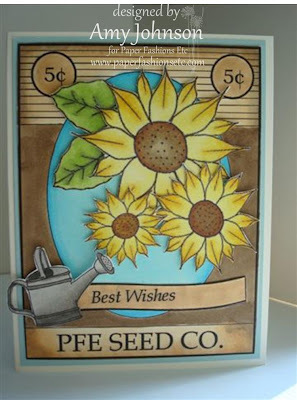 Today I have a Paper Fashions card to show you that uses an image from the set "Birds and Bees". My sketch is by Mojo Monday. The paper is My Mind's Eye 'Stella Rose'. I decorated the inside of the card too using the same image and a sentiment from the set "Thoughts of You". Hello! Today I have a Paper Fashions card that uses images from three different sets: "Seed Packet", "Garden Accessories", and "Banner Sentiments". You can find all these digis HERE. I love the 'Seed Packet' image because it makes a really easy card that looks like it has a lot of detail, but is actually really simple. There's no layout or picking designer papers involved; you simply print your Seed Packet to the size of the card you want, and then add your flowers and your done. You can leave your Seed Packet image in black and white, or print it on designer paper, or color it in as I did below. I wanted a more 'aged' look, so I shaded my Seed Packet with Copic Markers. 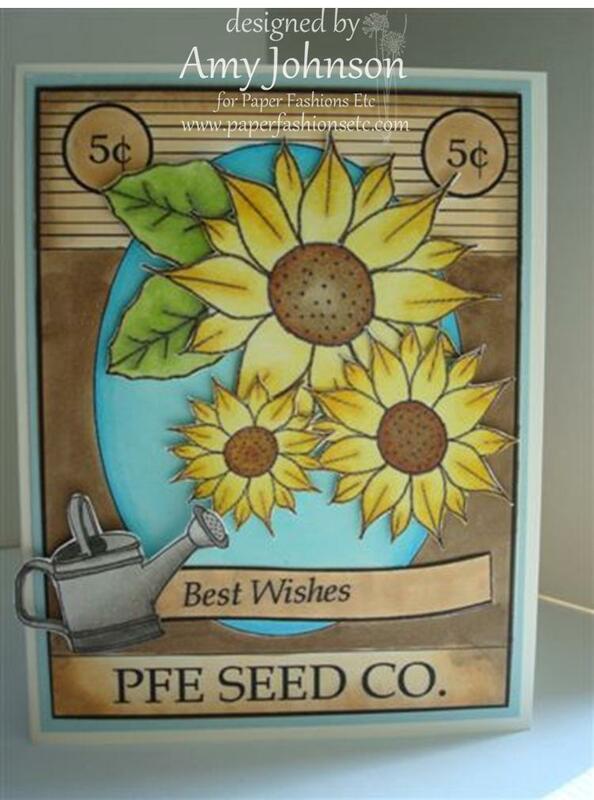 The Seed Packet comes with the sentiment 'Friendship Grows', but I needed an anniversary card, so I used the 'Best Wishes' 'Banner Sentiment' which is sold separately. My sunflowers and watering can are from the 'Garden Accessories' set. I mounted them up on dimensionals. Hi everyone! It's new release day over at McMahon Five Designs. 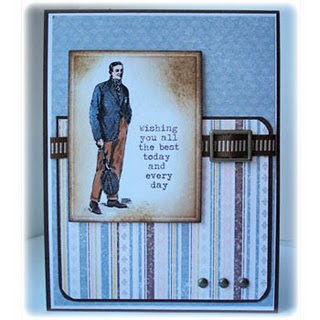 For today's post I'm showing a card that used pre-colored digital images, digi papers, and sentiment from Studio 313. It's called 'Modern Flowers-Chocolate'. This card was so quick and easy to make; my kind of card since it's such a busy time of year for me with my garden and all. All the digital papers and images match so perfectly, all I had to do was cut, assemble and go! I added an embossed panel of Stampin Up! 'So Saffron' card stock. I couldn't believe how well the embossing folder matched the designer papers. Be sure to check out the McMahon Five Designs Blog to see all the rest of this week's new releases. And while your at it, visit my fellow design team members blogs as well, they are listed in my sidebar. You may notice quite a few new names, we've added some new designers to our team, so be sure to welcome them.